Realize your Self on a Royal Enfield. Incidentally, I for one vastly prefer that old school Royal Enfield logo shown on the tank above. The newer curlicued one just kinda looks like something you might see on some 14 year old girl's Social Science notebook. What say you? Well, wonder no more! Why it's even MORE curlicuer!...and speedier too! Now to have maroon tank stickers made with the translation. Speaking of which, here it is in Tamil, official language in Chennai, (most appropriate for The Madras Missile) but without that crazy break-neck speed scroll. P.S., that green chrome would look good with a paralell twin too! Enfieldâ€™s comparative advantage is in selling connection to motorcyclingâ€™s past. It isnâ€™t there to surprise, but to delight. Viewed against that backdrop, the Interceptor 650 fits both the aspirations of Enfieldâ€™s domestic market and the values of the hipster or nostalgic motorcyclists it seeks to connect with in overseas markets. If thatâ€™s â€œsafe,â€� pleaseâ€”bring on more safety! I heartily agree. 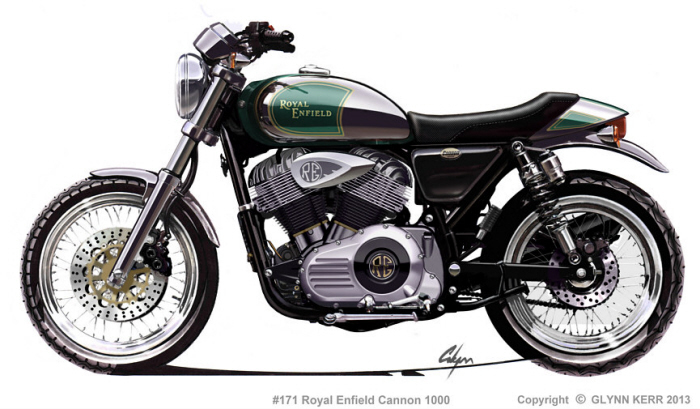 It would also be nice to see RE do a nice V twin like that beauty green & chrome version of 'er in Kerr's renderings. Nothing better than a nice putt on an RE. It's a serene way to travel at an unhurried pace. How about putting a Carberry or Musket V-twin in there? Yes, RE could easily do up the Carberry version due to having most of the parts in stock to produce 'em, and I also wish that they did. However, today's marketing is hell bent on moving product volume above all else, and the styling demanded by the most potential buyers generally gets the nod. I would be rather happy with a Carberry in chrome/maroon though. The author clearly doesn't understand the market which Royal Enfield has targeted. He talks about the "international motorcycle market" - while ignoring that most of the world moves around on sub-200cc bikes. Here in Latin America there's a huge gap between the multitudinous 100-200 cc bikes and anything over 500 cc's. The gap is not just displacement but cost. Honda and Yamaha have some 200 cc bikes that cost as much as a Royal Enfield - or more. The closest thing in displacement/cost is the Suzuki GS500 - and it's priced well above the Continental GT. By targeting the price/performance gap between all the little bikes and the larger ones, Royal Enfield stands a fair chance at dominating the market that the above mentioned author ignores completely. He can get his jollies from the European and Japanese bikes, which are WAY above reach for the vast majority of riders in Royal Enfield's target audience. Royal Enfield is putting decent bikes out at a level to which many more of us can aspire. Glynn Kerr started off his column this month with the following comment: "Last month, I lamented a lack of creative vision from companies that follow the design route of the obvious, and no doubt lost the support of Enfield aficionados in the process." So it sounds like he received a little push-back regarding his 650 twin being not all that exciting (design-wise) comments last month from his readers. However, this month he mentions motorcycle designs that went way too far. In particular, he provided photos of two electric motorcycles, the Johammer J1 and the British-designed Saietta. If you want to really see what going over the top really looks like just google those two bikes. That's hilarious! From his comments on the Royal Enfields, those are the type of bikes I figured he'd be thrilled with! Pretty sure that Saietta made its first appearance inside one of those embryonic tubes in Alien Resurrection. Glynn Kerr, whoever he is, is a bit of a pillock. Discuss. Glynn Kerr started off his column this month with the following comment: "Last month, I lamented a lack of creative vision from companies that follow the design route of the obvious, and no doubt lost the support of Enfield aficionados in the process." ...this month he mentions motorcycle designs that went way too far. In particular, he provided photos of two electric motorcycles, the Johammer J1 and the British-designed Saietta. If you want to really see what going over the top really looks like just google those two bikes. Re: Kerr on RE's: I can appreciate a lot of what he's written, but as much as he talks about it, I don't think he's quite in touch with the domestic (Indian) market. The new twins may be "lower risk" but IMO they are not entirely safe for the company. The Himalayan, even before all the technical issues came up, was being eyed very tentatively by many, and probably a majority of traditional Bulleteers wouldn't be caught dead on one, despite the "adventure" market getting hot and its generally being a lot more interesting and making a lot more sense design-wise and functionally than any Bullet. The twins in question, 270-degree crank aside, lack the all-important low-rpm "thump" that has thrilled Indians for decades... and will cost probably double what a nice-looking, 40kmpl CL350 does... and will require more capable mechanics than average to keep them serviced/repaired (and their company technicians have often been deplorable). No, they are not being viewed in the domestic market as "superbikes" - there are plenty of higher-performing machines available here already, the wealthy have no trouble shelling out double the U.S. price for Triumphs, and even a lot of middle-class persons are willing to pay loans on bikes costing double and more what the RE's probably will. There is indeed a lot of talk/interest (as there was for the Himalayan) and it's entirely possible that they'll sell well, but end of the day, someone has to plonk down the money (or fill out that loan application), and the cumulative mind is a little complex here. I think RE absolutely had to do this, they'll only be able for so long to keep selling underperforming singles in an advancing market... I respect Sid Lal and his team for all they've been aspiring to, and truly the company has grown by leaps and bounds, but producing a "world bike" is not an easy thing. The entire market here is risk-averse with good reason: by example Hero, since it was also mentioned, introduced India's "first" dual-sport bike in 2012 - I own one and it's not a bad bike, I guess it was successful enough in the Brazilian market, but here it was a monumental market flop, and despite Hero's finally offering them at large discounts, they still had unsold, rusting stock sitting around the factory as of last year, must have finally scrapped them when the BS (Euro) 4 laws came into effect. The actual first enduro/dual-sport was Kawasaki/Bajaj's KE100 "Endura" a couple decades back - another monumental flop. People thought these bikes looked funny, and the high mudguards did nothing to prevent their office shoes getting muddy in the monsoons. The Himalayan was certainly a risky venture against that backdrop. The Funduro flopped here, the Hyosung twins (cruiser and sport) flopped here, and dozens of good bikes of all types have come and gone, never really catching on for whatever reason. Not to mention widely varying regional preferences domestically. Not an easy place to do business IMO, and while India is changing rapidly, there's this (to me, despite 15 years here) very difficult to understand mix of lust for the latest/greatest/most adventurous and the sometimes very traditional, "safe" tastes / sensibilities of the oft-cited "herd mentality". Time will tell. Meanwhile I applaud RE for venturing out a bit. PS... forgot to mention that the KE-100 (/variants) was Kawi's longest-running bike ever, with 30-odd years production and sales successes worldwide. But hardly could sell any here. Come to think of it, RE has sold very few 535 Conti's in India either. Or even 500's, compared to the 350's. Things are changing, but not sure it's easy to predict the direction of the majority's tastes / whims.